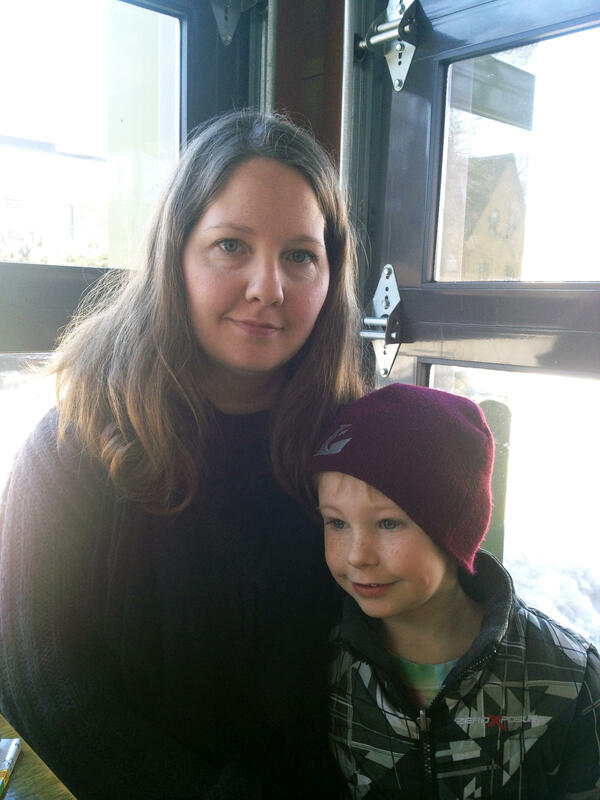 Jenni Hofschulte and her 4-year-old son, Lachlan. Meet Jenni Hofschulte, the 35-year-old mom who's one of the parents leading the charge against testing in Milwaukee. "I have two children in Milwaukee Public Schools," Hofschulte says over coffee at a cafe near her home. "The oldest one is in eighth grade." She's interrupted by her fidgety 4-year-old son, Lachlan. Hofschulte quiets him down, furrows her brow and begins again. Hofschulte says that when she found out her son would have to take a diagnostic test next year that's required of all Wisconsin kindergartners, all kinds of red flags went up. "Kindergarten is not the time to be stressing children out," she says. "I have opted him out." As standardized testing increases in public schools, so do concerns about its consequences. In a recent national poll, 60 percent of parents agreed there was too much emphasis on standardized testing in schools. And in cities across the country, those concerns are turning into a live political issue. Some are calling it a movement — the opt-out movement. Just in the past few weeks, New York Gov. Andrew Cuomo has faced off with New York City Mayor Bill de Blasio over a proposal to increase the role of test scores in teacher evaluations. And the Chicago schools were forced to back down from a proposal to give the Common Core-aligned PARCC tests to just 10 percent of students. The state board of education had threatened the loss of $1.4 billion in funding. Like most states, Wisconsin does not explicitly permit students to opt out of any mandated test. That leaves parents like Hofschulte in the position of needing special permission from her local school board if she doesn't want her children to take the tests. District officials say that while not very many parents are opting out of tests, complaints are growing. 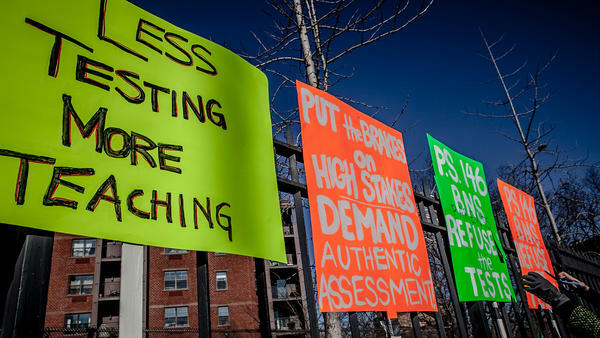 At a workshop organized by testing opponents, Reggie Jackson, a middle school teacher, called on parents to look at the district's calendar to see for themselves how time spent preparing students for tests gobbles up traditional instructional time. "We have 36 weeks in the school year, 20 to 24 of those weeks include testing," Jackson tells the gathering. "So all these weeks I'm not in the classroom, with my students, providing them the services that we're legally mandated to give them, and no one seems to really care about it." Just how many tests are Milwaukee students taking? It's surprisingly hard to nail that down. The federal No Child Left Behind law requires students to be tested every year in grades three through eight and once in high school in math and reading. The Department of Education says a total of 17 standardized tests are required at the federal level. And for Wisconsin? Fourteen during the K-12 years, says Tony Evers, the state superintendent. But, he says, local districts add more to the mix — like English-proficiency tests and end-of-course exams. Milwaukee's assessment director, Melanie Stewart, says the district is not testing as much as parents think. "Out of 180 school days, about two days students experience some form of a standardized test," she says. But some teachers and parents note that local, state and federal tests can add up. And the two days of testing Stewart is talking about doesn't include the days and weeks that kids spend preparing for tests. Or the tests that students take voluntarily in high school for advanced placement courses and college admissions. Mike Casserly, head of the Council of the Great City Schools, has a more nuanced perspective. "Whether or not people are testing too much is a judgment call," says Casserly. Casserly's organization is conducting the first-ever national inventory of testing policies in 67 urban school systems, including Milwaukee. He says based on the preliminary findings, one thing is clear: "A lot of districts give tests we don't need to give, or duplicate one another." Students on average take about 113 standardized tests between pre-K and 12th grade. Kindergartners are the least tested. The most tested students, hands down, are 11th-graders. So much so that Florida recently eliminated 11th-grade testing in language arts and is considering cutting back even more. Wisconsin's schools superintendent, Tony Evers, says it's not the amount of testing that should concern parents. "I think it's rather a question of what (testing) is used for," he explains. "If it's used to punish and to put more pressure on the system — instead of tests being used to identify weaknesses and strengths in kids — we've morphed into using tests for high stakes accountability, which is ridiculous." When I asked Evers if he has the power, as state superintendent, to act on these concerns, he responded: "Besides the bully pulpit? No." Evers says it's up to state lawmakers to decide whether schools should cut back on testing, or at least make sure schools are doing it for the right reasons. In the past year, eight states have actually done that. And Congress is currently debating whether the federal government should cut back on its testing requirements, too. Jenni Hofschulte says cutting back on testing can't happen soon enough. "I think we need to have a hard examination of the tests we're giving and the reasons we're giving them. The worst thing we can do is sort of roll over and say (testing) is just part of things," she says. For now, Hofschulte has made sure her 4-year-old won't have to take any tests. At least until third grade. And even then, she says, she'll have to think about it. With standardized testing season upon us, more and more parents are asking a couple of thorny questions. Are schools testing too much? And are they doing it for the right reasons? In Milwaukee, parents are calling for an audit of state and local testing policies; a few are even refusing to have their kids tested. This is happening as the first ever national study of testing policies is underway. NPR's Claudio Sanchez reports. CLAUDIO SANCHEZ, BYLINE: Jenni Hofschulte, the 35-year-old mom leading the charge against testing in Milwaukee, has agreed to meet at a neighborhood coffee shop near her home. JENNI HOFSCHULTE: I have two children in Milwaukee Public Schools. The oldest one is in eighth grade. SANCHEZ: With her fidgety 5-year-old in tow, Hofschulte quiets him down, furrows her brow and says that when she found out he would have to take a diagnostic test that Wisconsin now requires all kindergartners to take, all kinds of red flags went up. HOFSCHULTE: Kindergarten is not the time to be stressing children out, where they sit at a computer and have the questions read to them because many of them aren't reading yet. I have opted him out. SANCHEZ: The state of Wisconsin does not allow kids to opt out of kindergarten assessments because schools need to evaluate children's skills when they start school. So Hofschulte will need special permission from her school board. District officials say not very many parents are opting out of any tests, but complaints are growing. UNIDENTIFIED WOMAN: Teachers, students, community members, parents, thank you all for coming. SANCHEZ: At this workshop that testing opponents organized recently, Reggie Jackson, a middle school teacher, called on parents to look at the district's testing calendar to see for themselves how the time spent preparing kids for tests is gobbling up instructional time. REGGIE JACKSON: We have 36 weeks in the school year - 20 to 24 of those weeks included testing. So we have all of these weeks that I'm not in the classroom with my students, in the small groups, providing them with the services that we're legally mandated to give them, and no one seems to really care about it. TONY EVERS: Fourteen, I believe. That's it. SANCHEZ: Tony Evers is state superintendent of public instruction. He says the reason it's hard to nail down the exact number of tests schools give is because local districts add more to the mix - like English-proficiency tests and end-of-course exams. The number varies from city to city and grade to grade, but testing can increase significantly. Still Milwaukee's assessment director, Melanie Stewart, says the district is not really testing as much as parents think. MELANIE STEWART: Out of 180 school days, about two days students experience some form of a standardized test. SANCHEZ: Teachers and parents say local, state and federal tests do add up. MIKE CASSERLY: Whether or not people are testing too much is really a judgment call. SANCHEZ: That's Mike Casserly, head of the Council of Great City Schools, which is conducting the first ever national inventory of testing policies in 67 urban school systems, including Milwaukee. SANCHEZ: Students on average take about 113 standardized tests between pre-K and 12th grade. Kindergartners are the least tested. The most tested students, hands down, are 11th graders. Wisconsin schools superintendent, Tony Evers, says it's not the amount of testing that should concern parents. EVERS: I think it's rather a question of what it's used for. If it's used to punish and to put more pressure on the system - instead of tests being used to identify weaknesses and strengths in kids - we've morphed into using tests for high stakes accountability, which is just ridiculous. SANCHEZ: So do you, as superintendent of public instruction, have the power to act on these concerns? EVERS: Besides the bully pulpit, no. SANCHEZ: Evers says it's up to state lawmakers to decide if schools should cut back on testing or at least make sure schools are doing it for the right reasons. Eight states have actually done that in the last year, and Congress is debating whether the federal government should cut back on testing, too. HOFSCHULTE: I think we need to have a really hard examination of the tests that we're giving and the reasons that we're giving them. SANCHEZ: Jenni Hofschulte says it can't happen soon enough. HOFSCHULTE: The worst thing that we can do is to sort of roll over on the assessment and say that it's just part of things. BROCK: One, two, three, four, five, six. SANCHEZ: For now, Hofschulte has made sure her 5-year-old won't have to take any tests, at least until third grade. And even then, she says she'll think about it. Claudio Sanchez, NPR News. Transcript provided by NPR, Copyright NPR.